As a well respected, RCVS approved, training centre we offer the clinical training and work experience essential for undergraduate and post-graduate Veterinary Professionals. If you are interested in applying for one of our training programmes, click here to Register Your Interest. As part of your EMS, you will have the opportunity to follow our multi-disciplinary veterinary teams, attend emergency cases and case rounds. This is a fantastic placement opportunity for final year students. Our EMS placements are very popular so if you are a UK or ROI student, do please get in touch with your request as soon as you can. 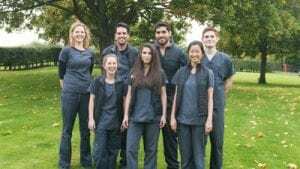 Our 12-month rotating internship has been in place for a number of years, offering rotations through Orthopaedics, Soft Tissue, Medicine, Cardiology, Oncology and a night rotation. There is also the option to rotate to Neurology, Ophthalmology or Anaesthesia. The programme includes some structured learning is provided, but much of your experience and development is provided through working with our specialists and managing cases in a clinical business setting. We also have specialty specific internships in Diagnostic Imaging and Ophthalmology. Many of our interns go on to achieve Residency training positions. Davies Veterinary Specialists is an approved training centre for a number of European specialist colleges. Our residents can enrol on an approved training program leading to Diploma examinations. As part of your residency training, you will have supervision from a senior clinician and have the opportunity to discuss cases with our multi-disciplinary teams. Davies is Vets4Pets Buckingham preferred specialists for the amazing patient care they deliver day in and day out.